Opportunity front Hazcam image taken on Sol 4979 (Jan. 25, 2018). NASA's Opportunity Mars rover has now been exploring the Red Planet for more than 14 years. 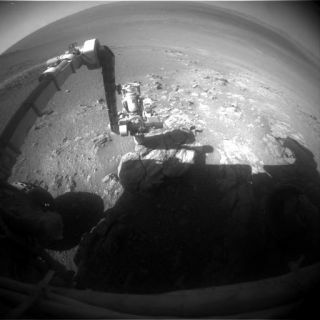 Opportunity landed a few weeks after its twin, Spirit, which also far exceeded its warranty. Spirit last communicated with Earth in 2010 and was declared dead a year later. On Sol (Martian day) 4977 — Jan. 23, 2018 — Opportunity received its latest version of flight software. This was copied over the older fallback version in preparation for an update scheduled for later in the year. On Sol 4970 (Jan. 16, 2018), wind cleaned the dust off Opportunity's solar arrays, a welcome event that happens often at this time of year. Researchers continue to use the rover's robotic arm, Alpha Particle X-Ray Spectrometer (APXS) and Microscopic Imager (MI), NASA officials said. Opportunity has moved along the north fork of one flow channel in Perseverance Valley. The rover spent several sols taking some photos — stereo shots, color panoramas and targeted 13-filter imaging — and traveling to selected surface targets for closer investigation. Opportunity Navigation Camera image taken on Sol 4978 (Jan. 24, 2018). Earlier in the month, ground controllers prepared and executed a test of the Zero Degree Heater (ZDH) on the rover's batteries. "Opportunity's batteries have performed very well over the mission's lifetime but are showing some signs of aging. [The] Martian environment is quite cold, and it was suspected that warming the battery during the recharge process may make the battery … more effective and [make it] degrade slower," said a recent update posted by the mission team. Opportunity had never used the ZDH before, so caution was warranted, the rover's handlers said. "Since it has never been turned on in flight, we wanted to be very cautious before using it operationally, and so a testing campaign was formulated. The first, original test in this campaign was to turn it on briefly, manually (as opposed to thermostatically), and in a controlled and recoverable (in the case of a fault) setting," the update noted. "This test was executed in the morning of Sol 4964 (Jan. 10, 2018) and appears to have been successful." Since touchdown on Mars, Opportunity's total journey now stands at over 28 miles (45 kilometers). No human vehicle has traveled farther on the surface of another world.